08.08.06 After two rounds a pack of eight girls are leading the tournament with 2.0 points. This report brings you another annotated game, Round 2 crosstable and a side-event update. 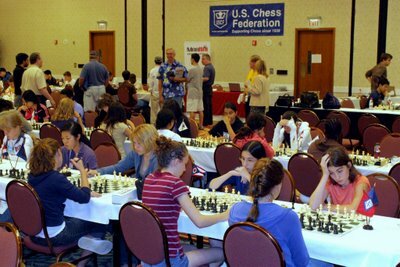 Margaret Bryan (immediate right) plays the white pieces during her 2nd round game with Emillia Stuart. The Latvian Gambit, or Greco Counter. I had never seen this opening before and decided to accept the sacrifice. Now we are already off book, and I am taking part in one of the most unorthodox games that I have ever played. At this point in the game I am starting to feel pretty confident. I am a pawn ahead and am about to go on the offensive. Okay, so that slows me down a little bit. No problem I just interposed with my bishop. Another attack by black, causing a slight hindrance in my plan to capture the knight. I was rather surprised by this move from Black. It would have made more sense to capture with the pawn. Thus the pin on the bishop would not be broken and I would not have the option of trading queens. Black no longer has the option of castling. I completely overlook the threat posed by the light squared bishop capturing on f5 and am only aware of the knight prepared to capture g4. Either way I’Äôm about to lose a pawn. Now black has a positional advantage and I find myself retreating and trying to prevent more of black’Äôs pieces from coming into play. I’Äôm pretty proud of this move. It wasn’Äôt that exceptional, but it got Black thinking and it prepared me for trading several minor pieces after ’Ä¶. I didn’Äôt think this move very productive because it allows me to advance my rook to g5, although it doesn’Äôt lose any material in the process. That was a waste of a move. Nxh4+ merely enabled black to attack my knight on the far side of the board, forcing me to retreat, and giving me no better position than I had before. Black offered a draw, and I agreed. I was somewhat relieved, for I felt that my pieces were cramped and not very mobile whereas Black had lots of space and could operate much more easily. Later today, at 6:00 P.M., there was a puzzle solving championship for girls, which I happened to be late for and did not participate in. However, I did take part in the blitz championship at 6:45. I am not very skilled at speed games and only won 2 out of six, finishing twelfth out of the sixteen girls that competed, but overall I enjoyed myself and found most of my appalling moves cause for humor rather than disgust.